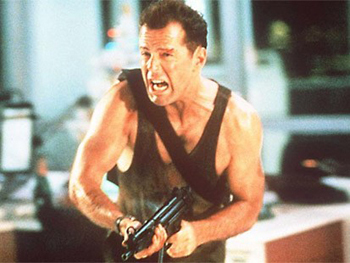 Not content with fighting all kinds of big bad guys over the years, Bruce Willis has now set his sights on Apple. In a crazy turn of events that could only ever occur over in Hollywood, the actor is considering legal action against Apple over rights to his iTunes music collection. The action star has allegedly spent a small fortune on digital music over the years and wants to be able to pass on his extensive collection to his kids when he dies. However, the music you “buy” on iTunes isn’t really yours, according to The Telegraph you’re only actually “borrowing” it under a very specific license that means it can only belong to you. According to sources, Willis is looking at different ways to get around the problem, by setting up a trust that contains his music or taking down the man by supporting others seeking similar rights in other parts of the US. This latest case (if we can call if that yet) has certainly opened up a lot of people’s eyes when it comes to who really owns the digital content they think they’ve “bought”, when really it’s just like we’ve all been throwing our hard earned cash at a big library for the past few years. This latest case (if we can call if that yet) has certainly opened up a lot of people's eyes when it comes to who really owns the digital content they think they've “bought”, when really it's just like we've all been throwing our hard earned cash at a big library for the past few years.